Set among quiet gardens, conduits, select pools and Madinat Jumeirah's private shoreline, the spacious and lovely summerhouses of Jumeirah Dar Al Masyaf offer rich and extensive guestrooms with spacious yards, customized services and a much-adored Arabian extravagance encounter. Each summerhouse has nine to eleven guestrooms, including one suite. Contingent upon its area, they are named Arabian, Gulf and Ocean. Every summerhouse additionally includes a commonplace Arabian Majlis, or front room, where sundowners are served to visitors every day. 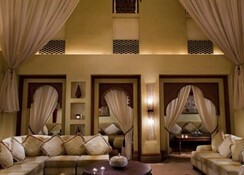 Souk Madinat Jumeirah, which is steps away from the accommodation area, includes more than 80 shops, bars and eateries. 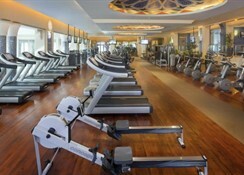 Access to Talise Spa and Talise Fitness, tennis and squash courts and in addition boundless access to Wild Wadi Waterpark™ are on the whole accessible to visitors. The hotel offers excellent ocean views and is renowned for its exceptional service. This is a perfect location appropriate for both families and couples. The premises offer a tranquil ambience which is ideal for Honeymoon getaways. The Dubai International Airport is 22km, while the Al Maktoum International Airport is 27km from the hotel. Luxury rooms set in 2-storey Old Arabian-style houses come with balconies/terraces and marble bathrooms, as well as free Wi-Fi, flat-screen TVs and minibars. 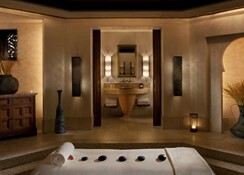 Suites feature all modern amenities and have added complimentary airport transfers and breakfast. Villas, on the other hand offer kitchens, hot tubs and pools. 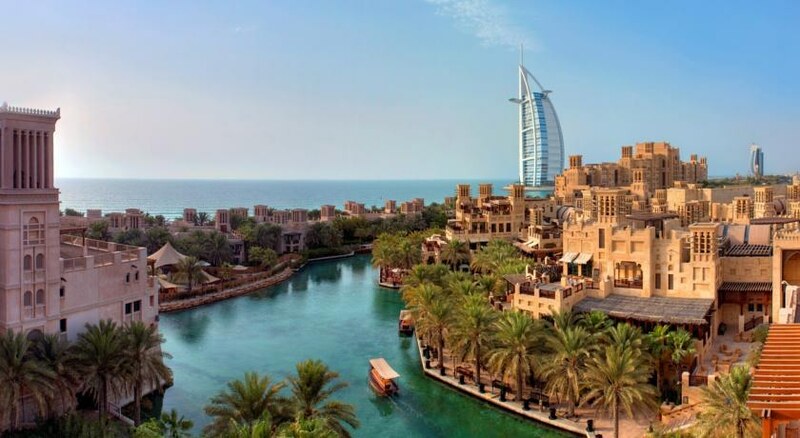 There’s one thing more wonderful than the nature of the eating and drinking at Madinat Jumeirah – and that is its sheer number of restaurants and bars the hotel premises provide. The hotel is located inside the main Madinat Jumeriah complex alongside other hotels and you can have access to more than 40 world-class eateries, bars and parlours to browse. You'll appreciate a wide variety of dining options – cuisine each with a remarkable taste, style of cooking and flavour of the land. Regardless of whether you feel like having the best of oriental cuisine or the best of cocktails, you’ll discover your tastes completely fulfilled at Madinat Jumeirah. Spread over a huge expanse overlooking the Jumeriah Beach, the hotel has its own artificial waterways and a boat service called Abra which takes you to various places of interest inside the hotel. Jumeirah Dar Al Masyaf hosts a lot of activities that caters to guests seeking thrill and adventure like rock climbing, windsurfing, sailing, waterskiing, banana rides, kayaking and wakeboarding. The hotel can also arrange for a boat to take you to deep sea fishing. There is also a kids’ club which features a splash pad, swing sets and a jungle gym. 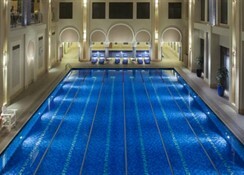 Other amenities include a spa, theatre, fitness centre and a private beach. Two children under the age of 12 years can stay free of charge. Maximum number of extra beds permitted is one.